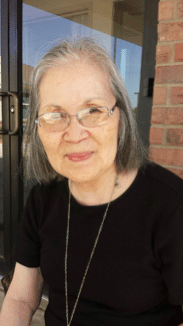 Tazuko Rediger,age 83, passed away on Thursday, January 17, 2019, at Brookdale Bethany. She was born on January 24, 1935, in Kagoshima, Japan, the daughter of Giichi and Yoshi Miyoshi. Tazuko graduated from Shibushi High School in 1953. On June 10, 1964, she was united in marriage to James W. Rediger in Fukuoka, Japan. After several moves as an Air Force spouse, she moved to Del City, Oklahoma, in 1979. She worked as a clerk for the City of Del City’s Public Works Department for 6 years. In her spare time she enjoyed reading and gardening. Tazuko is survived by two children, James (Maria) Rediger, Jr. of Yukon, and Debra (Mikel) Merritt of San Antonio, TX, seven grandchildren, Noah Rediger, Sandra DeLoera, Abigail DeLoera, David DeLoera, Eleanor Merritt, Isaac Merritt, and Ethan Merritt. She was preceded in death by her husband, her brother Yoshio Kajiki, mother and father. Memorial services will be held Saturday, January 26 at 11:00 a.m. at Yukon Church, with Pastor Keith Henson officiating. Inurnment will be at 2:00 p.m. at Sunny Lane Cemetery in Del City, graveside service with Chaplain Gregory Pierce. Memorial contributions may be made to the Alzheimer’s Association 225 N. Michigan Ave., Fl. 17, Chicago, IL 60601.